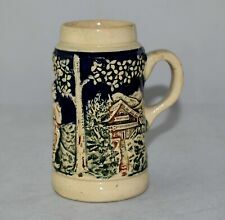 Vintage Stoneware Stein Beer Tankard Made in Germany. Very Good Vintage Condition - No Damage. The rim of the tankard is of a beige lustreware. All the colours of the tankard are bright and clear. In excellent condition. Vintage German stoneware tankard with decorative hinged pewter lid. A Very decorative German stoneware tankard with a hinged pewter lid. A very nice item. Approx size 5 1/2ins tall. C=6584 R - Written On The Base. German Stein Tankard Forester & Wife With Dog Made in. Japan -Cast Into The Base. The Mier Space Station To Outer Mongolia - Estimate Only! 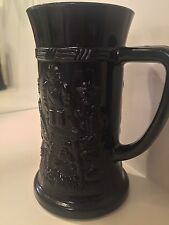 A German ceramic beer tankard / stein. In excellent condition. 4 3/4" tall. SMALL VINTAGE GERMAN TANKARD DEPICTING GERMAN PLACES OF INTEREST. DRACHENFELS, DOM ZU KALN AND BEETHOVENSTADT BONN. 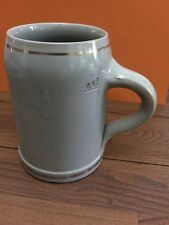 A German ceramic beer tankard / stein. In excellent condition. 5.5" tall. A stunning blue Gerz original stein / tankard with lid. This stainless steel tankard hold 1 pint / 560ml and is adorned with a pewter emblem of a Alsatian on the side. The Marco Polo German Bierfest Ceramic Tankard. 0.25 Tankard / Skein. See photos - rare German 0.25 sized tankard. 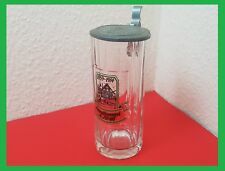 Lidded Pressed Glass Tankard Lager Bier Stein Mug. There is a 'stress' split/crack in the pewter lid - just below the portrait along an edge - see photo #8. The lid is a little wobbly and hinge may need to be tightened. As you can see in the photos, the tankards have various marks on the base. A ceramic / earthenware beer tankard / stein that celebrates the German Olympics in Munich in 1972. It features the Olympic rings, dates etc. This is a thick tankard and quite heavy. this mug is very rare and is in excellent condition. for sale in the uk only. In very good condition. Too small to be a tankard unless it was a sample / marketing piece. HEIGHT 4 1/2" DIAM BASE 2 1/2" APPROX. A Very Large and Heavy Lowenbrau Tankard. It’s approx 7.5” in height, 4” in diameter across the top and 4” across the base. Please see the pictures for a closer inspection and feel free to check out my other items. Good Condition For Ots Age. The two deep vermillion/brown bands of colour around the body make a pleasing contrast to the cobalt blue. SHOT / BEER MINIATURE TANKARD. Glass is 7.8cm tall approx. PLAIN DESIGN AROUND THE WHOLE TANKARD. THIS IS A PROMOTIONAL MUG. IMAGE OF MAN WEARING RED HOLDING BEER. This is from my grandfathers collection and he had displayed on the mantle piece for many years. The stein is very decorative and colourful and is in nice condition. The only area that lets it down id a slight chip on the inside of the lip, I have shown this in the photos. Celebrate their heroic victory with this expertly engraved, elegant gift. You must send goods back by a signed for service. Our engravers will always lay your text out center aligned. If an item is not suitable for the engraving you would like, we will try to let you know as quickly as possible and suggest an alternative, if we can. One Egon Bay & One unmarked Vienna souvenir piece. as can be seen in the clear pictures, One is stamped E Bay for Egon Bay - the smaller one is a souvenir pieces from Vienna. Colour:Light Brown (Suela). Colour Light Brown (Suela). MATE GOURD: For your gourd to be ready for use, it needs to be cured. You will notice that the longer you use your gourd, the better your Yerba mate will taste.